Earlier this week, the Straphangers Campaign handed out their annual subway rankings, and they mysteriously awarded the 7 line the top spot while knocking the B and 5 train to the bottom. It’s confounding to see this rankings because they don’t make much sense. The C and R trains all perform much worse than the B and 5, and the F and G suffer on seat availability and service consistency. The B I take every day, and it’s an average subway line for what it is (which is complementary service along routes with other express or local trains), and the 7 is a packed train suffering from unreliable service due to an array of issues. But that’s all anecdotal anyway. I’ve had bones to pick with the Straphangers’ methodology in the past, and the awards are designed to garner headlines more than anything else. That a major riders’ advocacy group claims most subway rides aren’t worth the fare is problematic by itself. If you’d like to read their full report, have at it. Anyway, as Friday night rolls into Saturday, the weekend service advisories are focused around the 1 train, or lack thereof. The MTA has shut down the 1 train for the entire weekend. Alternate service includes the 2, 3, A and C trains, some regular Manhattan buses and free shuttle buses. It’s not ideal for anyone, and the MTA put out a press release calling the work “absolutely critical in order to provide safe, reliable service into the future.” The work includes brick arch repairs at 168 St and 181 St, repairs in the vicinity of 125 St, track panel installation north of 215 St and ongoing Hurricane Sandy recovery work at the South Ferry station. The 2 and 3 will still run local. From 11:30 p.m. Friday, September 18 to 5:00 a.m. Monday, September 21, 1 trains are suspended in both directions between Van Cortlandt Park-242 St and South Ferry. Take the 2/3/A/C trains, M3, M100 and free shuttle buses instead. 3 service operates between Chambers St and 148 St overnight. From 11:30 p.m. Friday, September 18 to 5:00 a.m. Monday, September 21, 2 trains run local in both directions between Chambers St and 96 St.
From 11:30 p.m. Friday, September 18 to 5:00 a.m. Monday, September 21, 3 trains run local in both directions between Chambers St and 96 St.
From 11:45 p.m. Friday, September 18 to 7:30 a.m. Sunday, September 20, and from 11:45 p.m. Sunday, September 20 to 5:00 a.m. Monday, September 21, Crown Hts-Utica Av bound 4 trains run express from 125 St to Grand Central-42 St.
From 11:45 p.m. Friday, September 18, to 5:00 a.m. Monday, September 21, 5 trains are suspended in both directions between Eastchester-Dyre Av and E 180 St. Free shuttle buses operate all weekend between Eastchester-Dyre Av and E 180 St, stopping at Baychester Av, Gun Hill Rd, Pelham Pkwy, and Morris Park. Transfer between trains and shuttle buses at E 180 St.
From 11:45 p.m. Friday, September 18 to 5:00 a.m. Monday, September 21, Brooklyn Bridge-City Hall bound 6 trains run express from 125 St to Grand Central-42 St.
From 3:45 a.m. Saturday, September 19 to 10:00 p.m. Sunday, September 20, Brooklyn Bridge-City Hall bound 6 trains run express from Pelham Bay Park to Hunts Point Av. From 7:30 a.m. to 9:00 p.m. Saturday, September 19 and from 11:00 a.m. to 8:00 p.m. Sunday, September 20, 6 trains run every 16 minutes between 3 Av-138 St and Pelham Bay Park. The last stop for some trains headed toward Pelham Bay Park is 3 Av-138 St. To continue your trip, transfer at 3 Av-138 St to a Pelham Bay Park-bound 6. From 12:01 a.m. Saturday, September 19 to 5:00 a.m. Monday, September 21, A trains are suspended in both directions between Euclid Av and Ozone Park-Lefferts Blvd. A service operates in two sections between Inwood-207 St and Euclid Av, and between Rockaway Blvd and Far Rockaway every 20 minutes. Free shuttle buses operate between Euclid Av and Lefferts Blvd, stopping at Grant Av, 80 St, 88 St, Rockaway Blvd, 104 St, and 111 St. Transfer between trains and free shuttle buses at Euclid Av and/or Rockaway Blvd. From 3:45 a.m. Saturday, September 19 to 10:00 p.m. Sunday, September 20, Coney Island-Stillwell Av bound D trains are rerouted via the N line from 36 St to Coney Island-Stillwell Av. From 6:00 a.m. to 11:30 p.m. Saturday, September 19 and Sunday, September 20, World Trade Center-bound E trains skip Briarwood and 75 Av. From 11:45 p.m. Friday, September 18, to 5:00 a.m. Monday, September 21, Jamaica-179 St bound F trains run express from Neptune Av to Smith-9 Sts. From 11:45 p.m. Friday, September 18, to 5:00 a.m. Monday, September 21, Jamaica-179 St bound F trains run express from W 4 St to 34 St-Herald Sq. From 6:00 a.m. to 6:00 p.m. Saturday, September, 19 and Sunday, September 20, Coney Island-Stillwell Av bound N trains are rerouted via the R line from Canal St to Atlantic Av-Barclays Ctr. Trains stop at City Hall, Cortlandt St, Rector St, Whitehall St, Court St, Jay St-MetroTech, and DeKalb Av. From 11:45 p.m. Friday, September 18 to 5:00 a.m. Monday, September 21, Astoria-bound N trains are rerouted via the D line from Coney Island-Stillwell Av to 36 St.
From 11:45 p.m. Friday, September 18 to 10:00 p.m. Sunday, September 20, Coney Island-Stillwell Av bound Q trains run express from Prospect Park to Kings Hwy. From 6:00 a.m. to 6:00 p.m. Saturday, September, 19 and Sunday, September 20, Coney Island-Stillwell Av bound Q trains are rerouted via the R line from Canal St to Dekalb Av. From 6:30 a.m. to 12 midnight Saturday, September 19 and Sunday, September 20, R service is extended to the Jamaica-179 St F station. From 11:45 p.m. Friday, September 18 to 6:30 a.m. Sunday, September 20, and from 11:45 p.m. Sunday, September 19 to 5:00 a.m. Monday, 36 St-bound R trains stop at 53 St and 45 St. Shortly after the Straphangers released their annual State of the Subway Report Card, a producer at WNYC, issued what I think is the quintessential New York take on these rankings. As you can see, his belief is that if your train isn’t at the bottom, you’ll be outraged and appalled. He’s captured the essence of the way New Yorkers tend to project their feelings on the subway, but even then, things aren’t that bad. Mostly, we get to work on time, and we get where we’re going relatively quickly even if things aren’t perfect. So just how imperfect are things? According to the Straphangers’ rankings this year, somehow, the 7 train came out on top while the 2 train ended up at the bottom of the list. Sometimes, I think these rankings are, much like the U.S. News & World Report lists, designed to be different each year so we have something to talk about, but who am I to complain? These rankings are, after all, fodder for today’s post. This year, the 7 line emerges victorious. Despite our seemingly endless wait for a new station at 34th St. and 11th Ave., apparently, this line with its service patterns and CBTC-inspired weekend shutdowns along with a creaky tunnel and constant crowds came out on top. The Straphangers say a ride on the 7 is $2 — though we’ll come back to that later — and praised the train for its “frequency of service”, lack of delays caused by mechanical breakdowns and, somehow, seat availability during rush hour. On the flip side, my dear 2 train came in dead last. I ride the 2 fairly regularly in Manhattan and Brooklyn and, absent some crowding, don’t find much wrong with it. The Straphangers, though, fault the line for irregular service, mechanical breakdowns and seat availability during rush hour (but does any subway line worth its salt have seats available during rush hour?). What’s odd about the 2 train’s ranking is that its cars’ mean distance between failures is still well over 125,000 miles. But as this rolling stock is the oldest of the new breed and other lines are receiving the latest and greatest, the numbers start to sag a bit. However, in the Straphangers’ first State of the Subway report, the 2 train’s old redbirds latest just 71,000 miles on average between failures. My, how our expectations have changed. The rest of the report card is a succinct summary of the subways. Most of the lines are very crowded at rush hour; announcements on newer rolling stock are easier to hear; trains themselves aren’t that dirty (while stations can appear dirty or grimy); and regularity of service is a low-level problem but one that’s more obvious than others. Overall, though, for yet another year in a row, the Straphangers have determined that no subway line is worth the price of even a discounted MetroCard swipe, and this has always rubbed me the wrong way. By undercutting the value of a MetroCard, the Straphangers are urging everyone to think that we’re getting ripped off. Even as the group has tried to increase the dollar value of its rating to meet fare increases, the perception is that we’re not getting what we paid for. For at most $2.50, I can get just about anywhere reasonably quickly. I’d say that’s a good deal, warts and all. In the grand scheme of the way I use the city’s transit system, I don’t get too worked up over trends in subway car cleanliness. Trains are constantly in motion, and it’s easy to see how one person — that woman who drops her French fries on the ground and tries to hide it by stepping on them; the man using the subway floor for his chewed up sunflower seeds — can ruin it for everyone. By and large, I find subway cars clean enough for every day usage, but not anywhere I’d really want to settle into. The number of clean subway cars declined between 2011 and 2013, according to the thirteenth and fourteenth annual “subway shmutz” surveys released today by the Straphangers Campaign. Campaign surveyors rated 52% of subway cars as “clean” in a survey conducted in the fall of 2011. But this fell to 42% in an identical survey in the fall of 2013 – a statistically significant decline. This continues a general trend of a decrease in the number of clean subway cars since 2008. Cleanliness dropped from 56% in 2008 to 51% in 2009, then again to 47% in 2010. There was a modest improvement in cleanliness to 52% in 2011, but a significant decrease to 42% in 2013. The worst performing line in our most recent 2013 survey was the D, with the smallest number of clean cars at 17% in this survey, down from 49% back in 2011. The best performing line in our 2013 survey was the L with 63% of its cars rated clean, up from 58% in 2011. Nine of the twenty subway lines grew significantly worse, while none improved and eleven stayed largely the same. “Transit officials are losing the war against dirty subway cars,” Jason Chin-Fatt, field organizer for the Straphangers Campaign, said, thus making sure that everything possible is a war. It’s worth noting that the Straphangers Campaign’s findings and the MTA’s own metrics differ considerably here, and therein lies the story. The MTA believes that 92 percent of its cars are acceptably clean; the Straphangers believe that nearly 60 percent aren’t. The Straphangers believe, even with the number of cleaners holding steady over the past few years, that conditions are worsening; the MTA does not. The Straphangers couldn’t pinpoint the differences. As they group notes, methodology is nearly identical, but Adam Lisberg, MTA spokesman, last week to vehemently dispute the findings. It seems that the MTA measures car cleanliness at terminals while the Straphangers surveys trains en route. It’s challenging to keep subway cars moving and clean at the same time, and the MTA doesn’t have the manpower to sweep out cars in motion. Still, even with this back-and-forth, I have to wonder if it really matters. The subways are the subways, and their level of cleanliness, so long as food is allowed and litter laws barely enforced, will have, as the Straphangers have termed it, shmutz. It’s worse in the winter when we track in dirty snow. But give me a train that runs quickly and on time, and I can find a way to forgive some dirt. In an ideal world, New Yorkers spend very few minutes on subway platforms. Trains whisk us away from these waiting areas, and they become liminal zones we pass through on the way to and from various destination. But it doesn’t always work that way. We wait and take in our surroundings, and what we see is not always pretty. As the MTA has struggled to maintain the systems that move trains — switches, tracks, signals — the station environment has often drawn the short straw. Generally, the work performed to make walls and platforms look good is cosmetic, but it causes service disruptions as trains have to be rerouted to ensure the safety of the workers. It makes sense, in a way, for the MTA to prioritize key components, but riders who want a pleasant experience often don’t agree. They want nice platforms that are clean without a sense of neglect. They don’t want dirt and grime, but that’s what they’re getting. Yesterday, the Straphangers Campaign released its assessment of subway platforms and, not so surprisingly, found platforms to be “grim” and “dirty.” Their findings included observations of garbage on platforms and staircases or handrails in disrepair. 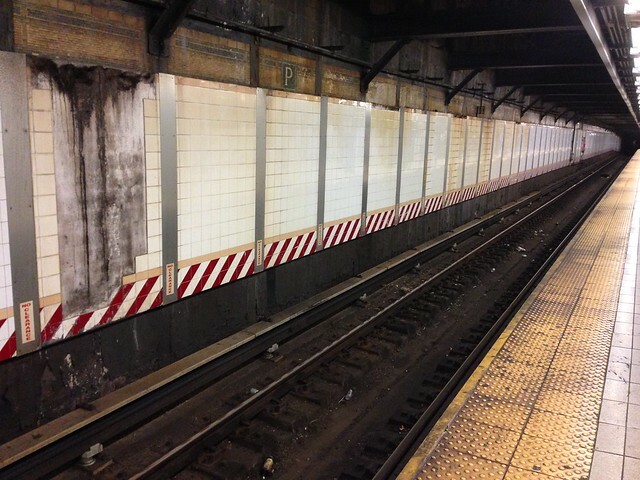 Nearly a quarter of platforms had exposed wiring or “substantial areas of missing tile.” A third of all stations had visible graffiti and 40 percent had floor cracks. Another similar survey conducted at fewer platforms found rats at 13 percent of platforms and broken light fixtures at 20 percent of platforms. Water damage and peeling paint were found at over three quarters of the platforms. “We found what many riders know from bitter daily experience: Many subway platforms are grim and dreary,” Jason Chin-Fatt, the Straphangers Campaign field organizer, said. In four metrics, the Straphangers found the station environments to be worse this year than last. Those include exposed wiring, graffiti, missing tile and lighting. The aesthetics, in other words, are on the decline. Safety is our top priority when it comes to the condition of our stations and platforms and all safety-related defects are repaired in short order. Our operating and maintenance forces have identified and repaired more station defects each of the last few years than ever before and we are on target to surpass last year’s results. In 2012, over 39,000 defects were repaired and we are projected to complete more than 53,000 in 2013, a 36% increase. The items in the Straphangers report highlight elements that would be extremely costly to keep in perfect condition and would do little, if anything to either improve service or make stations safer. We have to prioritize projects using available funds to address the most pressing needs first. Over the years, the MTA has issued various reports concerning the items identified in the Straphangers’ report, and ultimately, it all boils down to prioritization and use. If the items in question do not impact core functions — that is, the running of the trains — the MTA is hesitant to begin costly cosmetic improvements. For the sake of the agency’s delicate bottom line, I understand it, but should we accept it? The stations themselves set the tone for the system. If passengers see stations that are well-kempt and in good repair, they are more likely to appreciate and enjoy the subways while working to keep it clean. If stations are a mess, customers will treat the subways as such. There’s no easy way out of this problem since nice stations cost a lot in both money and diversions, but it’s not a black-and-white issue that can be boiled down to a price tag. For the past few years, the MTA has embraced mobile communication by issuing digital alerts for most major incidents that lead to subway service changes, and a few months ago, the agency posted the alerts archive to its website. An enterprising organization looking to assess major subway delays could parse that database for information, and that’s just what the Straphangers Campaign did this week. According to the subsequent report, the MTA issued more alerts for the F line than any other, and the G train suffered the fewest. After Superstorm Sandy, though, alerts increased by nearly 30 percent, portending a system suffering from saltwater corrosion. It is, unfortunately, impossible to know from the text alert archive how long these various service changes lasted, but the data provides a further glimpse into the way we ride. The most improved line was the G, which had 19% fewer delay alerts, comparing the first ten months of 2011 to the same period in 2012. 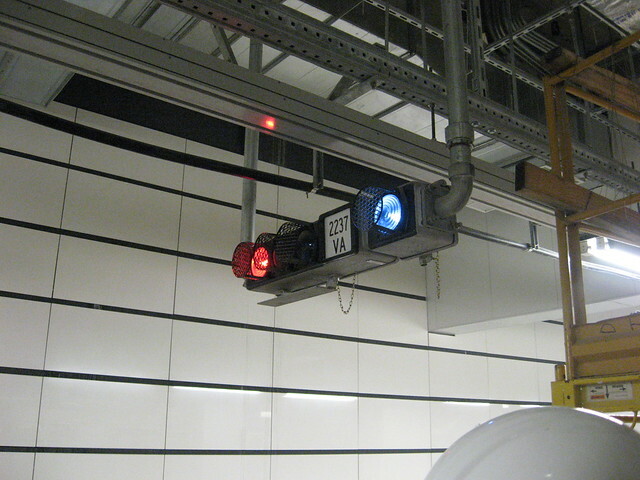 The G went from 42 MTA delay alerts in 2011 to 34 alerts in 2012. The L worsened the most — by 60% — from 84 MTA alerts of delays in 2011 to 134 alerts in 2012. Manhattan was the borough with the most MTA alerts with 1,219 out of 2,669 in the first ten months of 2012, almost half of all total alerts. The Bronx had the least in 2012 with 9%. The most improved borough was the Bronx with 17% fewer MTA alerts of delays, going from 283 alerts in 2011 down to 235 in 2012. Queens performed the worst, going from 392 alerts in 2011 to 458 in 2012, a 17% increase in delays. “Mechanical problems” generated the most alerts — 36% — or 949 out of 2,669 alerts in 2012, followed by “signals.” While the number of mechanical delays increased 25% between 2011 and 2012, the number of signal delays remained unchanged. Additionally, as I mentioned, track, switch and other mechanical problems drove a big jump in text alerts after the system reopened in the wake of Superstorm Sandy. From what I’ve heard, these Sandy-related problems will only increase until the MTA commits extensive resources to repairs on a number of flooded tunnels. That time is coming soon, and the service advisories will be quite severe, according to my sources. G and R train riders, in particular, may find their tunnels undergoing extensive repairs in the coming months. The MTA has yet to comment on these reports. The agency did, however, issue a statement on the Straphangers’ study. Without offering much further explanation, a Transit spokesman said in an email, “The Straphanger Campaign’s use of the MTA’s email Service Alert as a barometer of individual subway line performance does not paint a full picture of service issues. However, it does serve to highlight one of the efforts in place to keep our customers informed.” The statement went on to nod at the wait assessment figures provided to the MTA Board, but those numbers aren’t as indicative of delays as the text alerts. Ultimately, we know that subway service is fraught with problems. The system prior to Sandy needed to be modernized, and then-MTA Chair Joe Lhota spoke extensively about a capital campaign focused around just that sort of effort. Now that the mechanical aspects to the subway are suffering, that effort becomes even more vital. Unfortunately, it’s likely to get worse before it gets better, and that database of text alerts will grow and grow and grow. Every year, the Straphangers Campaign goes through the pomp and circumstance of their Schleppie and Pokey Awards, and every year the outcome is the same. Some crosstown Manhattan bus is the slowest, and some north-south route is usually the least reliable. This year was no different as the M66 and M42 shared the Schleppie Award, and the M4 took home the Pokey. The Straphangers’ report — full findings here — says that the two crosstown buses average around 3.9 miles per hour during their 12 noon runs. I’d imagine that time is even slower during rush hour when 42nd St. grows congested. “The M66 and M42 would lose a race to an amusement park bumper car,” Straphangers head Gene Russianoff said, “and be a lot less fun. A bumper car can go 4.3 miles per hour compared to the 3.9 miles of the Pokey Award winning buses.” The M4, meanwhile, suffered the most from problematic bus bunching and scheduling inaccuracies. Of course, knowing that the buses are slow and unreliable is half the battle and barely news. While nodding at the city’s Select Bus Service as a clear sign of improvement, the Straphangers and Transportation Alternatives called for “investment,” but what kind of investment? The city should devote dedicated street space to buses, implement pre-board fare payment at most major routes and develop signal prioritization. Only then will buses begin to move faster than a healthy young adult can walk across town. Any veteran subway rider knows to dread an announcement concerning “an unavoidable delay.” Such a proclamation can precede an endless wait in a tunnel somewhere as some mysterious problem causes back-ups up and down the line. Details are scarce, and the waits infuriating. But what if those unavoidable delays aren’t so unavoidable after all? For straphangers stuck in a train, the MTA delivers scant information. We never find out the why or wherefore of the service delay unless we seek it out. Yesterday, though, the Straphangers Campaign pulled back the curtain a bit, and after analyzing the 2011 service delays, what they found were a bunch of potentially avoidable delays based on the city’s aging subway signal system. By analyzing the MTA’s text message alert system, the Straphangers produced a report on subway delays. The total world of delays included 4580 alerts, and the Straphangers determined that 1613 of them — or 35 percent of the total — were uncontrollable. That is, they involved sick passengers or police activity outside of the realm of the MTA. The remainder were indeed avoidable. The 2 line had the most controllable significant incidents in 2011. The 2 line accounted for 251 out of 2,967, or 8% of all controllable significant incidents. The 5 line came in a close second, with 247 controllable significant incidents. This was also 8% of all controllable significant incidents. The G line had the fewest controllable significant incidents in 2011. The G line accounted for 45, or 2%, of all controllable significant incidents. The most frequently occurring type of controllable significant incidents in 2011 was signal problems. This reason accounted for 36% of all controllable significant incidents. The 2 and 5 lines, of course, share trackage in both Brooklyn and the Bronx so it’s no surprise that those two lines are intertwined in their delays. As critics of the G may say, since the train never runs, it can’t be delayed (but we know those numbers are due to the fact that it’s a one-train route from Queens until Bergen Street). The Straphangers posed a few questions based on their data, and one in particular caught my eye. “Are there explanations,” they asked, “for why signal and mechanical problems constitute more than two-thirds of all significant controllable incidents?” The easy answer concerns the age of the subway infrastructure. Simply put, the equipment is very, very old; some signals are pushing 70. This technology needs to be better maintained and, more importantly, upgraded both to maintain current capacity and throughput and allow the MTA to expand its services. So maybe this is indeed all about signals. The MTA plans to spend around $3 billion on signals over the next few years and will look to increase that amount when the pressures of funding — but not building — the megaprojects start to come off the books in 2015. Can we wait a few more years to upgrade this vital, if hidden, part of the subway system? We may have little choice, but all of a sudden, that less-than-ambitious capital plan looks a little more promising.